Who else loves low-carb spring rolls? A family favourite that has a multitude of filling options that everyone will love. Just scroll to the bottom of the post and see all the tasty ideas. UPDATE: Scroll to the bottom to see my new cooking video. Low-carb spring rolls as you can see, are actually quick and easy to make. Gone are the high carb rice papers, rice noodles and the unhealthy oils they are usually fried in, and instead I use wilted cabbage leaves. Low-carb spring rolls can be made as big or as small as you prefer. If you were to make smaller ones, they could be served as a starter/appetiser or as a party platter. If you make them large, they can be served as a complete family meal. You can easily vary the fillings, and therefore the carb content. For example, if you want to lower the carbs, omit the carrots and green beans, and add more low carb vegetables. Great vegetables are bok hoy, celery, mushrooms and spring onions. (see below for all the filling options). You can also vary the meat. If ground/minced chicken isn’t your thing, go for beef, lamb, prawns or fish instead. NOTE :: I occasionally make my low-carb spring rolls using rice papers for my children’s lunch box. Some readers complain that this isn’t strictly low carb, and I completely agree, but my reasoning is two-fold. Firstly there are between 4g – 10g carbs in a medium rice paper (depending on size and brand) AND secondly, rice papers are a great sturdy way for spring rolls to survive the journey to school in their lunch box. They will no longer be low-carb spring rolls, but are a great option for children who don’t need to monitor their carbs as closely as I would. These little low-carb spring rolls are the perfect healthy way to amp up your veggies. A gluten-free healthy nutritious meal for tonight. Gently fry the onions, garlic and any other spices in oil until cooked, but not browned. Add the chicken (or other meat) and stir until thoroughly cooked. Prepare your vegetables by slicing, grating, shredding or dicing them. To prepare the cabbage leaves, place each cabbage leaf in a bowl of boiling water using kitchen tongs. Leave each cabbage leaf in the water for 1 minute, or until soft and bendy. Remove from the boiling water. Place a wilted cabbage leaf on the chopping board. Add your cooked chicken (or other meat), vegetables, herbs and sauces. Begin by folding the bottom of the cabbage leaf over the fillings, fold in the sides then continue to roll up the entire spring roll. Place each low-carb spring roll on an oiled baking tray and bake at 180C/350F for 10-15 minutes. No nutrition facts can be given as the fillings and vegetables used will vary widely. Each cabbage leaf is 0.5g net carbs, chicken, beef, pork and most other meat will be zero carbs. For the carb values in vegetables, see here. Low-carb spring rolls are perfect for dinner, snack, appetiser, and school lunch boxes. Fill them with your favourite protein, sauces and vegetables. Here are just some of my favourite filling options. Please leave a comment and tell me what you would serve inside. Serve with a salad, steamed vegetables, bok choy, dipping sauces, sprinkle with sesame seeds when the spring rolls come out of the oven. If you have time, make a double batch and that is school lunch sorted for tomorrow (and maybe the next day). Thanks so much for this recipe. I really look forward to trying it. Made these last night and they were delicious however the cabbage was really, really, hard to bite. I cut mine up with a knife. How do I get the cabbage leaves to be softer? I just wanted to pick them up to eat like a real spring roll. Did you soak the cabbage leaves in boiling water for long enough? You need to leave them in for a minute or so, depending on the thickness of the cabbage leaf. The outer leaves are always the most solid and sturdy, so maybe next time soak choose inner leaves and soak for longer. They are yummy so keep trying, you’ll love them. Just wondering what sauces to use in this recipe ? No sauces are necessary 1) flavours and juices come from the oil and the chicken as they are cooked wiht the onion nd garlic 2) most sauces are high sugar. If you are missing a sauce (and sauces can make a dish) then why not try coconut aminos which is a healthy alternative to soy sauce. Or you could make a dipping sauce using coconut cream and Chinese 5 spice and a pinch of salt. 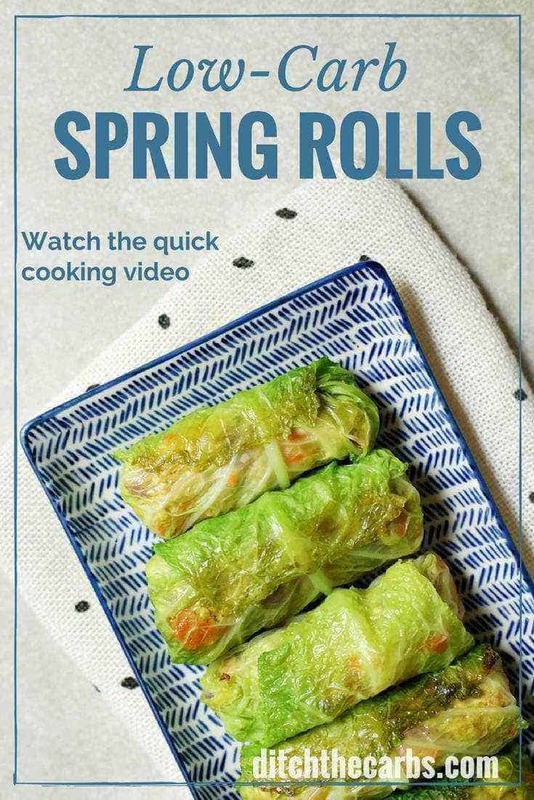 My spring rolls benefit from a splash of syrup on the outside and stay in the oven until the cabbage leaves are slightly browned and just turning crunchy. Now that I’m doing LCHF how to prepare a syrup substitute using erythritol? I am cooking at 375F since the recipe doesn’t say. Thanks, Ive updated it now. The recipe doesn’t say the temp to bake them at, so I am trying 375 degrees. Great way to make spring rolls! Love the difference combinations.